Welcome aboard everyone! We now have more than the required number of interested builders so I will go ahead and make the formal application along the lines outlined earlier. This promises to be fun & educational, I count that as win-win. Thanks John, we're off & running! I have a copy of that book somewheres, I just gotta find it . . . 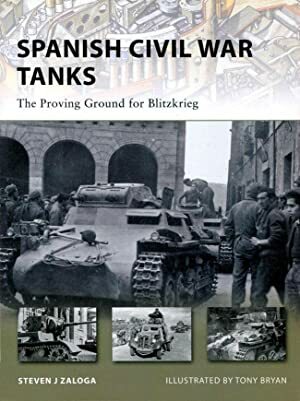 I just started reading the booklet Spanish Civil War Tanks and find it both informative and a very quick read. There were more tanks, armored cars & trucks that I realized involved including the old WW1 Ft-17s. I just added a campaign ribbon for this build. It is just the Spanish flag with the letters SCW. Comments? BTW, I see we are now official with ten builders so when the start arrives we are good to go! I like the idea for the campaign ribbon. Sounds like a nice ribbon. Hi Paul. I don't know if you posted the ribbon somewhere or it is just a proposal not yet completed. In any case and since the current spanish () flag, without the crest, only represents half the sides that were fighting, what about half the Nationalist flag and half the Republican flag with the letters SCW? OK, comments noted. I did not want to adopt the flag of the Republic as the ribbon so how about a hybrid? I also did not want to get too cute with the design as the ribbon is only 50 pixels across. Simple is better. Well Imagine my surprise when I just casually dropped back in here to have a quick look. I have been setting up and running an IPMS SIG for the Spanish Civil War, I started this earlier in the year so count me in. If you'd like to have a look at my site you may find some useful info, particularly on the Panzer 1 & Naval aspects of the war. Thanks for the comments on modding the ribbon. I have now uploaded the latest version as shown a few posts ago. I'm looking forward to this campaign! Jason - Welcome aboard our SCW campaign, its great to have your help & guidance in this area that is off the beaten track for most modelers. I would encourage our SCW builders to participate on your site as well. I had a quick look and right away saw your review of the old Inpact Bulldog. I have had one of the Inpact Gladiators in my display case for decades. It still looks good next to more recent models. Thanks for posting that link Jason, that site is very interesting reading, very helpful! I picked up Airfix's Ju-87B-1 on the weekend which comes with the markings for Kampfgruppe 88, Condor Legion in Spain in '38. No worries, glad the site can be of use, I'm certainly no expert but happy to help. Hi Linus, I just picked this one up myself its a cracker, I built the 1/72 version so wanted to do this one as a different number and in researching the group I found it quite interesting. Check this site out for some great pics of 29-8 and others from the group. I have seen some of these new 1/48 Airfix kits and they are very nice. One of the P-40Bs followed me home from my local friendly a few weeks ago. Mebbee for the Pearl Harbor campaign . . .